Welcome to the world of the Mitsubishi Outlander PHEV, the best-selling plug-in hybrid SUV with Super All-Wheel Drive (S-AWC) in Canada! The Outlander PHEV is equipped with many innovative safety and technology features, and will make you less concerned about emissions due to its plug-in hybrid electric system. At West Side Mitsubishi, we’ve taken the time for you and explored the different features in this vehicle, including its capabilities, range and charging time. Read along as we break down the different charging options for the Mitsubishi Outlander PHEV and the respective charging times for each option. When it comes to charging your Mitsubishi Outlander PHEV, there are 3 different options available. From the convenience of your home, you can charge your vehicle with the help of a professionally installed Dedicated Charging Unit. To charge the vehicle, make sure the ignition is turned off and take the charging cable from the wall unit and plug it into the left-hand charging port. Your second option is to use a standard domestic plug for charging at home. The Mitsubishi Outlander PHEV is equipped with a stand-alone charging cable in the rear hatch compartment, which you can then plug into the left-hand charging port. If you’re on the road and running low on charge, you can stop by a public quick charging station, which is the third charging option. Plug in the quick charge connector into the right-hand charge port on the vehicle. Charging your Outlander PHEV is a no-brainer thanks to the simple charging options offered by Mitsubishi. When charging your vehicle at home with a 120-volt household outlet or a Dedicated Charging Unit that produces 240 volts, it takes between 3.5 to 5 hours to fully charge your vehicle. A public quick charging station is more powerful and therefore only requires around 30 minutes to achieve up to 80% of a full charge. When charging with either option, make sure to turn the vehicle off before starting the charging process. 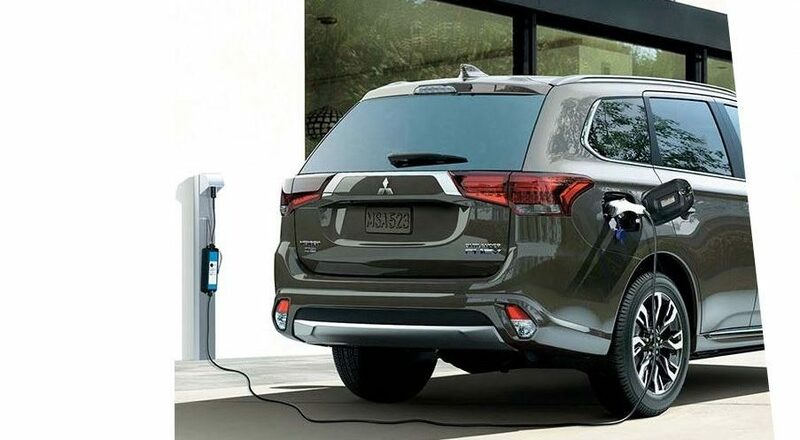 Your Mitsubishi Outlander PHEV will automatically stop charging when completed. Because the public charging station is so powerful, your vehicle’s AC system might automatically come on to cool down the battery. Charging your Mitsubishi Outlander PHEV is convenient, simple and fast!